At sunrise in some parts of China and by sunset in the western United States, a partial solar eclipse is set to slink across the Earth on May 20 and 21. Depending on where people are in the eclipse's path, some may be able to witness an annular eclipse in which the moon blocks out all but a ring of the Sun's light. Others will see the Sun as a crescent, partially obscured by the moon, for a period of around four to five minutes. The event will be the first time in 18 years that such an eclipse is visible from the continental United States, according to Fred Espenak, a longtime solar eclipse expert with NASA. 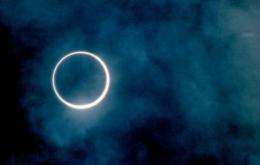 "What is unusual about this particular annular eclipse is that it goes over the western US," Espenak told AFP. "People always think that eclipses are extremely rare but there are at least two solar eclipses every year. Each of these annular eclipses covers a very small fraction of the Earth's surface." The path of the annular eclipse will span "a 240 to 300 kilometer-wide (150-185 mile) track that traverses eastern Asia, the northern Pacific Ocean and the western United States," according to the US space agency. 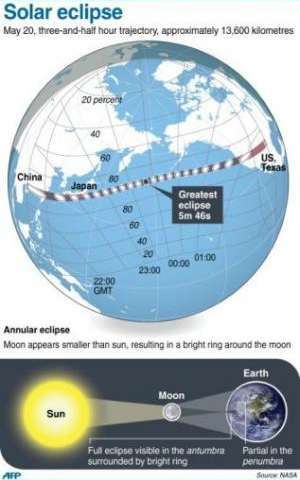 The eclipse begins at sunrise in southern China at 2206 GMT Sunday, which is early Monday local time, and swiftly travels eastward to the southern coast of Japan, NASA said. "Tokyo lies 10 kilometers (six miles) north of the central line. For the over 10 million residents within the metropolitan area, the annular phase will last five minutes beginning at 2232 GMT," said NASA. The shadow then embarks on a 7,000-kilometer-long Pacific ocean voyage that will endure for about two hours, skimming just south of Alaska's Aleutian Islands. The eclipse will reach the coastlines of southern Oregon and northern California Sunday evening local time, at 0123 GMT Monday, and it should be visible in Nevada, Utah, New Mexico, Arizona and Texas. The US East Coast will not see any of the eclipse because the Sun will have already set. "The desert areas of Nevada, southern Utah and northern Arizona may be the best (for viewing) if they have the greatest chance of clear skies and the eclipse takes place low in the sky over a dramatic landscape," said Alan MacRobert, editor of Sky and Telescope magazine. According to historical cloud data, China and Japan may be out of luck since a high likelihood of gray skies would block the view of the Sun. "Unfortunately this is monsoon season, and the weather prospects are supposed to be poor in southern China," MacRobert told AFP, but nevertheless urged residents to check local forecasts for updates. "China and Japan don't look to be very lucky for this. It would take quite a stroke of luck to get a clear sky." Of course, no one should look directly at the eclipse due to the risk of permanent eye damage. Even sunglasses are not enough to protect eyes from the glare. Instead, experts say a safe solar filter, such as a #13 or #14 rectangular arc-welder's glass or an astronomer's filter made specifically for Sun viewing are the best options. Espenak suggested another way to view it -- by holding binoculars with the eye piece pointed toward a piece of white cardboard and the outer end pointed toward the Sun. "The important thing is not to look through the binoculars," he cautioned. But by directing the eyepiece toward the white cardboard, "you get a magnified view of the Sun and the eclipse in progress." The next time the Earth will witness a total eclipse of the Sun, a more dramatic event than a partial or annular eclipse, will be August 21, 2017. "The next time the Earth will witness a total eclipse of the Sun, a more dramatic event than a partial or annular eclipse, will be August 21, 2017." The maximum duration of totality will be just over four minutes, a fairly long time, as solar eclipses go. It's not a coincidence this is happening a half month after the super moon. "The shadow then embarks on a 7,000-kilometer-long Pacific ocean voyage that will endure for about two hours"
solar eclipse.. such a beautiful event. I can't wait to see the total eclipse occurring in the US in 2017.